Recipient must be an incoming freshman from Vigo County, Indiana, enrolled full time with declared major in the College of Business. First preference will be to students majoring in accounting, management, or management information systems. Recipient must have maintained a 3.0 cumulative grade point average on a 4.0 scale while in high school. Preference will be given to students who have demonstrated leadership qualities, community service activities and/or a desirable work ethic. O. Earl Elliott, CPA, is President of Sackrider & Company, Inc., a certified public accounting firm in Terre Haute, Indiana. The firm's professional staff includes 15 Indiana State University graduates. Earl earned his bachelor's degree in accounting from Indiana State University in 1976. Since graduation, Earl and his wife, Tina, have founded and supported the O. Earl and Tina Elliott Scholarship, which is awarded each year to students who are effective leaders and have a well-documented record of community service. Earl is a member of the College of Business' Dean's Executive Council. Tina is Assistant Director of the Indiana Rural Health Association in Terre Haute. She earned her associate's degree in secretarial science and her bachelor's degree in management from Indiana State University in 1974 and 1983, respectively. 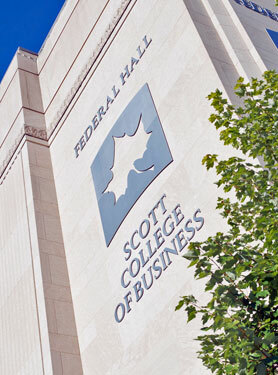 Their son, Mark, a Networks Scholar, graduated in 2011 with a degree in accounting from the Scott College of Business, as well as a minor in forensic accounting. Their daughter, Emily, is a 2006 athletic training graduate of Indiana State University. Their daughter, Megan, a biomedical engineer, is an avid Sycamore football and basketball fan.